Tired of your inefficient, difficult-to-maintain wood fireplace? Want to keep the ambiance of a fireplace without having to split, buy and carry wood? Burn bans got you down? Replace your wood fireplace with a gas fireplace insert! These can provide energy efficient, comfortable, zone heating for your home--without all the mess of firewood. Plus, decorative gas heating fireplaces are non-polluting and you can use them whenever you want (even during a wood-burning ban). Interested in getting a gas fireplace insert? Contact us online or call 1-800-888-1045. Why you should upgrade your current wood burning fireplace with a gas fireplace insert. What the difference is between gas fireplace inserts and zero clearance gas fireplaces. Why Should I Replace My Inefficient Wood-Burning Fireplace With a High Efficiency Gas Fireplace Insert? Much more convenient- You'll never have to mess with cutting, buying or hauling your own logs. There are no ashes to bag, no chimney or fireplace to clean. Starting and stopping the fire is as easy as the push of a button. Safer- Gas fireplaces have a safety shutoff to prevent gas from leaking into the house. Also you can't build a fire that's too big. Wood-burning fireplaces create creosote, a sticky, oily, combustible substance in the chimney, so you always have the danger of a life-threatening chimney fire. Also, you can build too large of a fire and overheat the chimney, which endangers your family in the process. Greater energy efficiency- Wood fireplaces are inefficient at best and downright wasteful at worst. With a wood fireplace, air from in your home is actually exhausted up the chimney and replaced by cold outside air. Gas fireplace inserts are much more efficient, allowing you to have the ambiance of an indoor fireplace while still keeping you and your home warm. Healthier for your family and the environment- Gas fireplace inserts don't burn wood, so they don't create indoor and outdoor wood smoke pollution which has been linked to cancer, asthma and other serious health conditions, according to the EPA. This is why you can still use them during a burn ban. What's the Difference Between Gas Fireplace Inserts and Zero Clearance Gas Fireplaces? Gas fireplace inserts upgrade your existing wood-burning fireplace. They are designed to be retrofitted into your current wood-burning fireplace, upgrading its efficiency and heat-producing capabilities. Zero clearance gas fireplaces are for homeowners who want to add an efficient fireplace to their home. They can be installed into a wall or framed into a mantel cabinet. This can be done without needing a pre-existing wood-burning fireplace. Learn more about Zero clearance gas fireplaces. Are Gas Fireplace Inserts Easy to Use? Yes. Depending on the features you have, you can turn on your gas fireplace insert with a touch of a switch or remote control. You can even install a wall or programmable thermostat to control the flame size and therefore maintain a specific temperature setting in the room. These modern thermostats can even be controlled using your smartphone or tablet from anywhere you have internet access. Will My Gas Fireplace Insert Still Work If I Lose Power? Absolutely! Storms don't affect natural gas or propane supplies. So, a gas fireplace insert will still provide heat and comfort during a power outage. 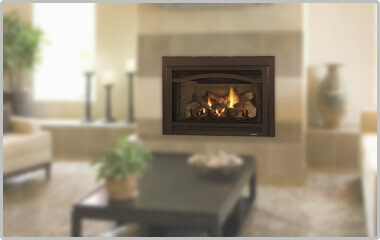 What Brands of Gas Fireplace Inserts do You Provide and Install?